Gangtey Monastery that overlooks the wetlands surrounded by subsistence farms and natural forest areas makes Phobjikha a stunningly beautiful and sacred valley. Today, this glacial valley is an attraction not just to tourists but also pilgrims. Besides being the home to the cranes, Phobjikha is also the livelihood base for about 5000 subsistence farmers who have aspirations for economic development. The Gangteng Monastery, also called the Gangteng Sangngak Chöling་, was established in 1613 by the first Peling Gyalsé Rinpoche or Gangteng Tulku, Rigdzin Pema Tinley (1564–1642), who was the grandson of the great Bhutanese “treasure revealer” Terchen Pema Lingpa (1450–1521). 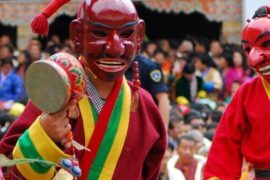 The earliest historical background relevant to this monastery is traced to establishment of the Vajrayana tradition of Buddhism, by Guru Rinpoche, who was instrumental in making Bhutan a Buddhist nation. The Guru, during his visits to the country in the 8th and 9th centuries, had hidden many sacred treasures (called terma) (images and scriptures), to avoid their desecration or destruction during troubled times, at various places in Bhutan to be retrieved in later years by treasure finders, to propagate the teachings of Buddha. These were retrieved at various periods over time and in the 15th century Pema Lingpa, born in 1450, considered an incarnation of Guru Rinpoche, prompted by a revelation of 108 treasure coves in his psychic dream revealed by his Guru Rinpoche. He embarked on the treasure hunt in 1476 when he was 25 years of age. He was successful in locating many treasures of images and scriptures related to Buddhism throughout Bhutan, which resulted in establishing many monasteries throughout Bhutan, and Buddhism took firm roots in the country. 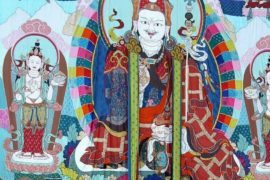 Consequently, Pema Lingpa came to be known as the “King Terton”, a revered saint and teacher. The Terton, came on a visit to the Phobjikha Valley as a saint to teach Buddhist precepts to the people and also to bless them. During this visit, after looking at the impressive mountains that surrounded the valley he had foretold that one of his descendants would build a monastery or gonpa on the Gangten (meaning top of the mountain) and make it famous as the seat of the Peling tradition. This prediction fructified when a monastery was built by his grand son Gyalse Pema Thinley in 1613, and the spur of the mountain was given the name, the Gangteng Sang Nga Choling (meaning: “summit for the teaching of the dharma”). He became the first Trulku (spiritual head of the monastery or gonpa) of the monastery. 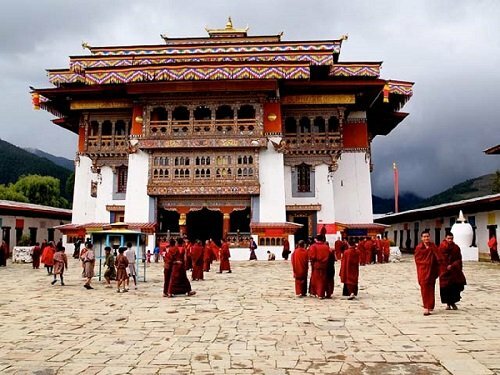 It was initially built as a Lhakhang, a small village monastery, which was later expanded by his son Tenzing Legpai Dhendup (1645–1726), who succeeded him as the second Trulku. It was built like a Dzong (fortress). The present Wangchuk Dynasty, which rules Bhutan, are descendants of Pema Lingpa.